This wine comes from a sister label of Baileyana. I reviewed their Pinot Noir after my friend gave me a whole case of it post-work party. I went to Baileyana’s Winery in San Luis Obispo with some friends after visiting Wolff Vineyards. Wolff was so much better by leaps and bounds. They brought you your pastings out on the patio and you could bring cheese and they even complimented me on my cheese choice (the Toscano soaked in Syrah from Trader Joe’s all day, everyday)! But at Baileyana’s it was hard enough to get anyone to notice you, and honestly the pours weren’t that stellar. 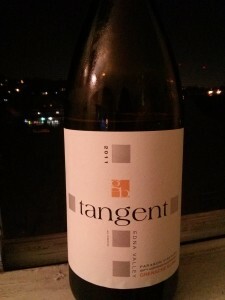 I bought the 2011 Tangent Grenache Blanc because on sale, it was about the same price as the tasting and if you bought a bottle, Baileyana waives the fee. So there you have it. I opened up this screw top bottle of this straw yellow white wine and got a whiff of a grassy smell mixed in with citrus. In addition to the zest on the nose, it’s crisp in the mouth with a bit of bubbly acidity. It can be a bit sour and that citrus smell returns at the end, but the flavor quickly gets flabby by the finish. Grenache Blanc is an interesting varietal and its seen more in Europe than in California. It tends to be blended with other whites, rather than standing on its own. It’s cousin, Grenache Noir, is certainly more well-known. When to drink: I don’t think I’d recommend this wine on its own. If you want a good stand-alone Grenache Blanc, try the 2012 Epiphany Cellars Grenache Blanc.